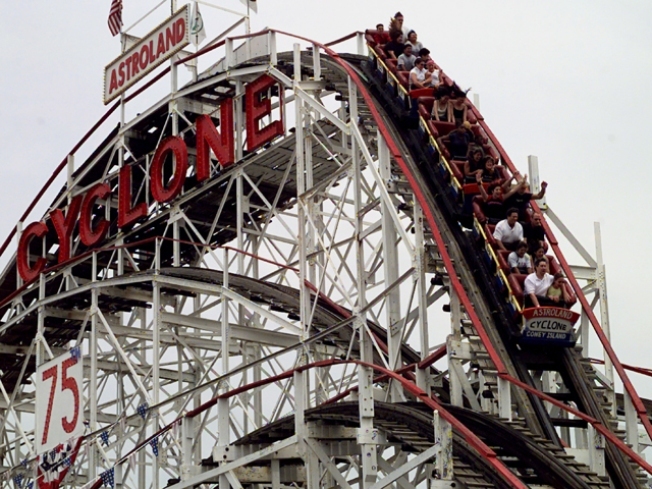 Visitors to Coney Island enjoy a thrill ride on the world famous "Cyclone" rollercoaster July 14, 2002 in Coney Island, New York. Coney Island, discovered by Dutch explorer Henry Hudson in 1609, has since been New York's main summer recreational attraction for both tourists and residents of New York City. Featuring entertainment parks, an aquarium, a public beach, boardwalk, fishing, and the most popular of all, Coney Island's own Nathan's restaurant which hosts the annual July 4 Hot Dog Eating contest. After years of hand-wringing over the future of Coney Island, Mayor Michael Bloomberg is promising 19 new amusement park rides this summer. They're made by an Italian company -- the world's largest manufacturer of mechanical rides. At a Coney Island news conference Tuesday, Bloomberg said the new "Luna Park'' will open on Memorial Day weekend. By summer 2011, Coney Island's new "Scream Zone'' will offer two roller coasters, a human slingshot ride and go-carts. The mayor also outlined plans to turn the run-down neighborhood into a year-round entertainment district with restaurants, retail stores and hotels. The renewal of the neighborhood by the Brooklyn boardwalk is moving forward after the city purchased land owned by a developer for $95.6 million, in November.